Read more about other progress areas from our Sustainability report 2017 pages 42-44. Resource efficiency in the production of renewables is mainly influenced by the efficiency by which renewable raw materials are converted into end products. We introduced a resource efficiency goal to monitor renewable oil loss in the pre-treatment of renewables refining in 2017 to increase focus and to accelerate improvements in this matter. Sluiskil pre-treatment plant acquisition contributes to resource efficiency in the production of renewables. Part of the renewable raw material volume is ‘lost’ in pre-treatment, when the renewable raw material is filtered using bleaching earth. Pre-treatment process generates spent bleaching earth (SBE) as a waste that contains renewable oil residues. SBE can be efficiently reused in several ways. In the Rotterdam area, SBE is re-used by co-firing to produce green electricity. The residual oil can be used as a material in own production whereas SBE as a material in concrete industry. Continuous air quality monitoring continued in the vicinity of the refinery sites. Ambient air quality in the areas surrounding our refineries in Porvoo and in Naantali remained generally at a good level during 2017; below all of the guideline and threshold values set by the Finnish and the EU regulation, and mostly compliant with stricter WHO recommendations. 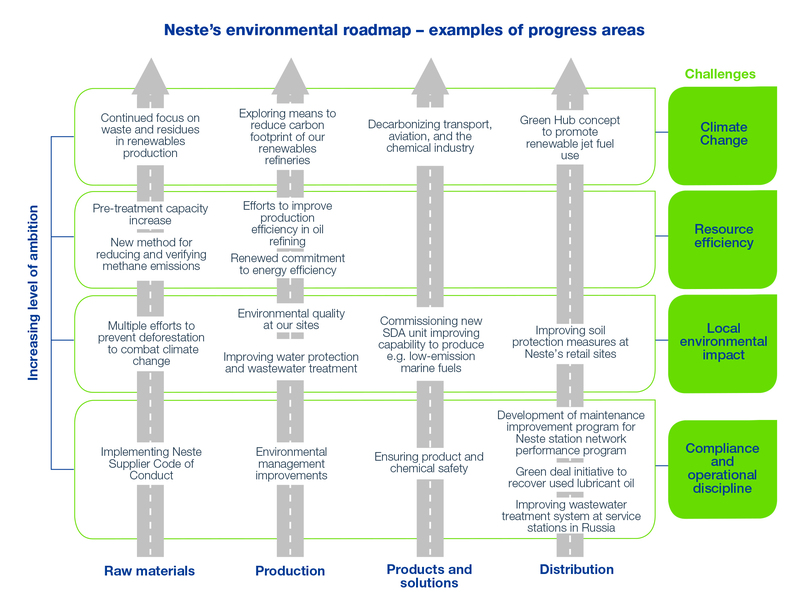 The impact of Neste’s operations to the local air quality in Rotterdam and Singapore is limited given the small amount of emissions. The soil at Singapore and Rotterdam production sites is clean; precautions are in place to prevent soil contamination. At our refinery sites in Porvoo and Naantali, historical soil contamination is present, and precautions are taken to prevent new contamination. Remediation based on risk assessment is done when necessary. With regards to pollutant control, we also offered our Porvoo site to an ongoing assessment of perfluorooctanesulfonic acid (PFOS) and perfluorooctanoic acid (PFOA) compounds by the Finnish Environment Institute. PFOS and PFOA compounds are considered polluting compounds affecting particularly surface water courses, and global due to their persistent and bioaccumulative properties. These compounds can be found in the fire fighting foams that Neste has used for decades in fire fighting practices in the refinery area in Porvoo. In 2016 and 2017, during civil engineering work of the new power plant in the Kilpilahti industrial area in Porvoo where our refinery is located, fluorinated compounds such as PFOS were removed from the soil of the fire department’s old training area. A new fire training area was built with better soil protection measures, to prevent the soil contamination in the future. We introduced advanced secondary containment as well as soil and groundwater protection solutions to some of our fuel station network sites located at groundwater catchment areas in Finland. The protection solution comprises several protective layers of bentonite and HDPE liners together with double skin storage tanks, double skin pipelines, double skin oil/water separators, and specific bunds to contain unlikely accidental fuel releases. Such protective structures go even beyond the heavy requirements set forth in a retail station standard SFS 3352:2014. We aim at responsible water use and minimizing our water related risks both in our own operations and in our supply chain. Singapore is categorized in the Water Resources Institute’s Water Risk Atlas as a high water risk area. This has long been acknowledged in Singapore's water strategy, which has allowed the country to build an internationally recognized, robust and sustainable water supply. Consequently, Neste consumes almost exclusively reclaimed wastewater and demineralized water for its production purposes at its Singapore refinery. Also, the production process of our renewable products yields new water, which enables Neste to reduce its water footprint by discharging this new water into Singapore’s reclaimed water system. At all our production sites (Porvoo, Naantali, Singapore, Rotterdam), cooling water required for the refining process is withdrawn from a sea and returned back to source in a similar condition, with a slightly elevated temperature. We were able to continue maintaining sea water quality at a satisfactory level around our refineries in Porvoo and in Naantali where wastewater is discharged into the sea after purification. The level of oil discharge remained very low. Due to some wastewater quality challenges we faced in 2017, we started making technical improvements to the wastewater treatment facilities and the related procedures at Rotterdam and Singapore refineries. Wastewaters generated at these renewables refineries have only a limited effect on the quality of water courses and water management systems. At the end of 2016, we started a project to install more efficient wastewater treatment systems at our service stations in Russia. The new system provides a high degree of wastewater treatment for car washes, mainly improving the removal of metals. The new system allows us to also reduce water consumption from the water supply system by 70%, and replace it with recycled water. The new system is now operative at one service station, and we plan to install it at two other ones during 2018-2019. In 2016, we exceeded our energy savings target of 660 GWh for 2009–2016 by reaching the level of 855 GWh savings compared to 2008 energy usage level. The target was a part of an efficiency program for Finland’s energy-intensive industries. Although we clearly improved our energy efficiency during that period, CO2 emissions from refineries did not decrease linearly. This was due to the fact that the utilization rate of our refineries was high, and the share of high-quality products increased. Processing of such high-quality products requires more energy when converting crude oil more efficiently. We continued our commitment to the energy efficiency programs, and during a new agreement period 2017–2025, we aim at saving 500 GWh from the 2014 level. The new energy efficiency savings target is an ambitious one, requiring new investments. Neste is prepared to voluntarily participate in a program for used lubricant oil recovery proposed by the Ministry of Environment in Finland. The program is called “Green Deal for used oil recovery”. Under this program, oil industry operators will be required to promote used oil recovery and ensure environmentally sound disposal of waste oil with priority to regeneration. We planned a program to improve maintenance of certain environmental critical operations and devices at the station network sites such as oil-water separators and sumps. We expect to implement the program in 2018.